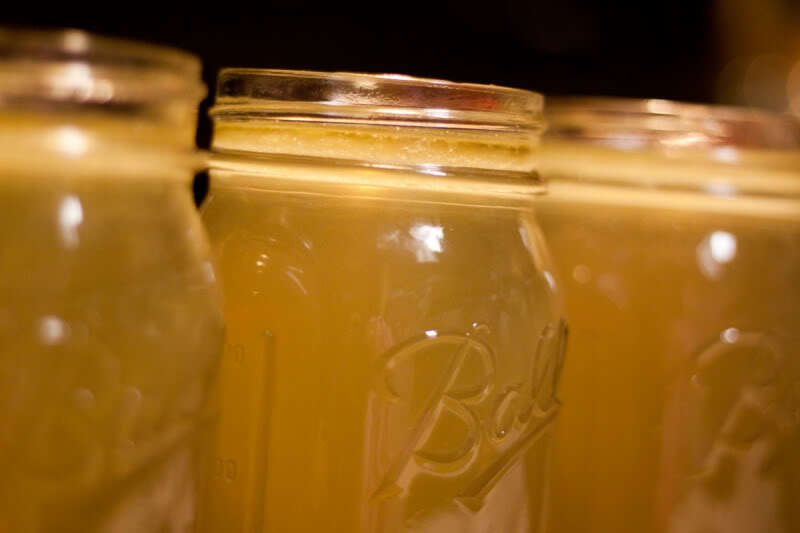 I wanted to share with you all the recipe for bone broth that I recommend to my clients. 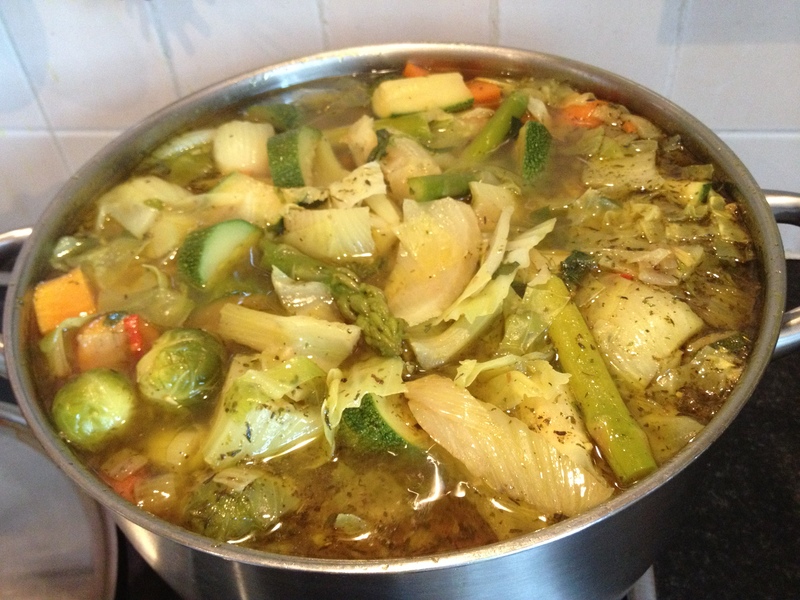 Bone broth is an amazing nourishing and healing food; especially for those on a gastrointestinal healing programme, recovering from illness, going through the wringer with food poisoning (add brown rice or quinoa to the broth), or if embarking on a nutrition bomb-packed detox (if detoxing aim to add some sea-weed to the mix). 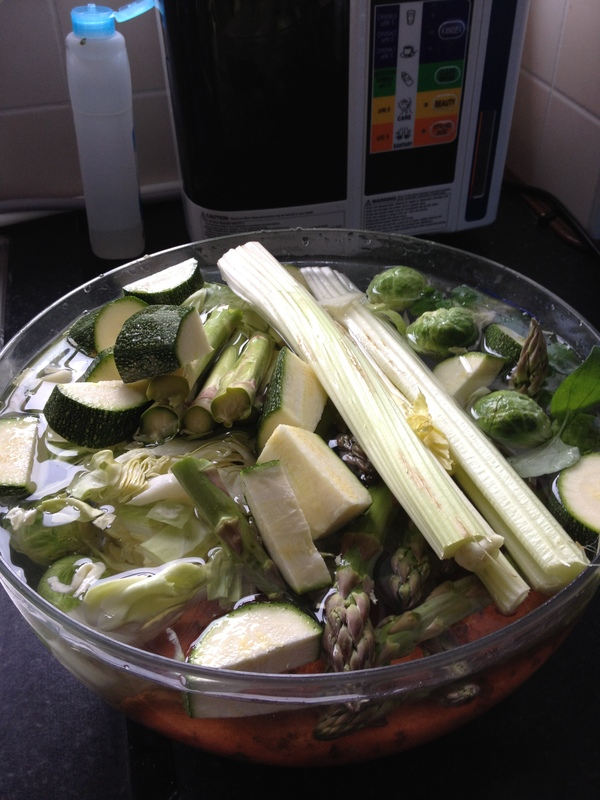 Simply make a giant pot of the steaming healing liquid and enjoy often during the day. Extra can safely be frozen in Pyrex dishes or glass jam jars and removed from the freezer the night before you plan on enjoying to permit the soup to defrost naturally. To keep this article short and concise please follow the links below to The Westen A price Foundation and Marks Daily Apple to learn more about the fantastic health benefits of bone broth and also for more recipes to keep you on your toes! 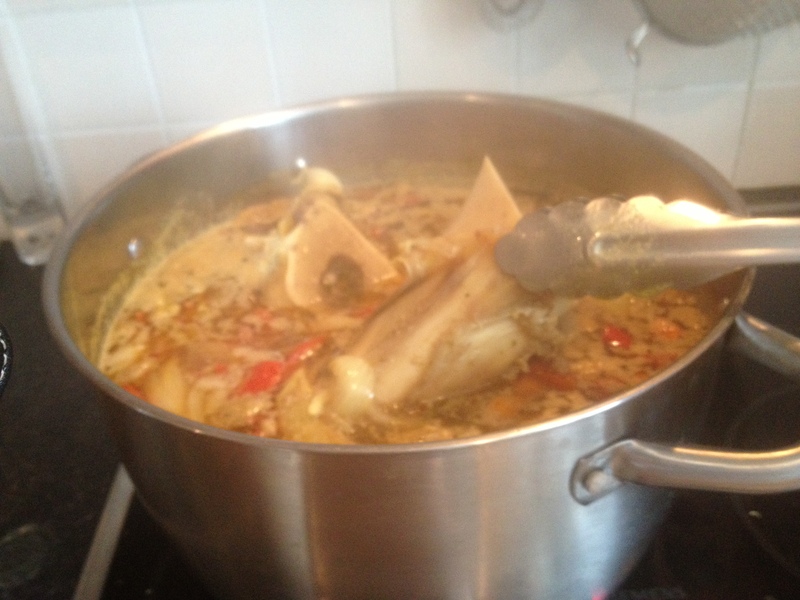 2 to 3 beef bones with marrow (the bones should be open so that the marrow can seep out and not sealed where the marrow remains trapped within the bones. Beef bones are available FREE from your local butcher. Don’t purchase if you are wary about their quality). Generous amount of Kangen 9.5 pH water or (filtered water if you do not have access to Kangen) sufficient to drown the meat! Also add 2 tablespoons approximately of vinegar (e.g. cider, wine, sherry, tarragon, etc. NOT malt vinegar). This is a steaming pot of veggies and bones. They will simmer for approximately an hour after which the kale or cabbage will be added for a few minutes; avoid over-cooking the kale or cabbage. Generous amount of Kangen 9.5 pH water or (filtered water if you do not have access to Kangen) sufficient to drown the meat!! Also add 2 tablespoons approximately of vinegar (e.g. cider, wine, sherry, tarragon, etc. NOT malt vinegar). (If you are using a nice cut of meat and wish to make a richer sauce then red wine is an option here also; and less water). Prepare all your veggies, by peeling, soaking, washing and chopping. Place a large stock pan on the hob and warm a dash of coconut oil (my personal preference) or extra virgin olive oil or organic butter (or bone marrow fat). Add your onion, garlic, chili, ginger, and turmeric and allow to sauté until the onion starts to turn transparent (you may wish to open a window for this!!!). Add a large volume of water (and your vinegar or wine); I use Kangen 9.5pH water as this is clean filtered water with special alkaline and micro-clustering properties that improve the taste and nutritional content of my food. Allow this to get hot and then add your chosen meat. In this recipe I chose free-range organic chicken. If using beef or lamb on the bone you may wish to brown the meat first in a heated frying pan or in a very hot oven to seal in the juices. After the addition of the bird (or meat) to the water (and vinegar), onions, herbs, and spices. 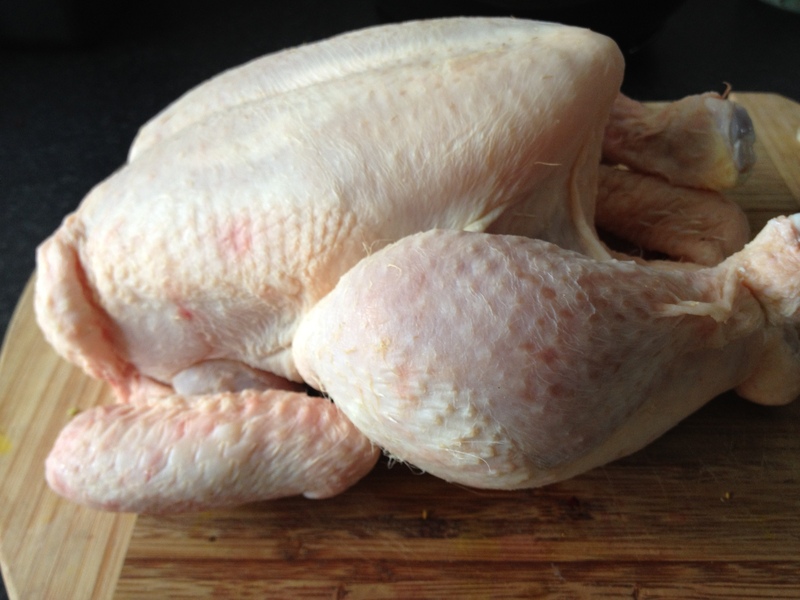 The chicken flesh or meat and stock may start to take on a very yellow colour due to the turmeric; this is ok! At this point add your dried herbs of choice and dried turmeric; be generous. Himalayan salt and black pepper may also be added. The finished product; there is meat swimming in there somewhere!!! 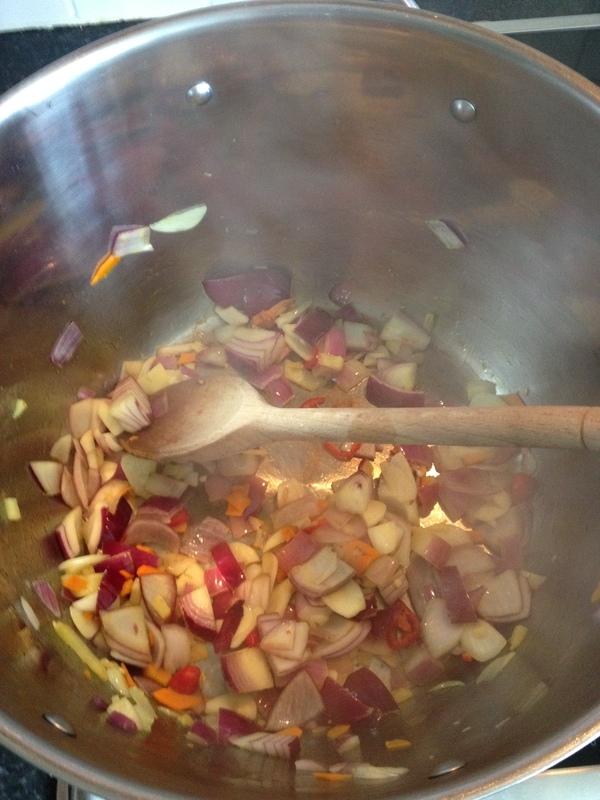 Due to the large amount of turmeric I use there is quite a strong colour to the stock pot. I also skim off excess fat that rises to the surface with the use of a fat strainer (not all of it as a certain amount is good for you. If feeding this to children then leave all the fat in the stock as this is excellent for them). 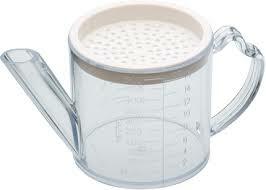 This little gadget is so handy for separating fats from stock. 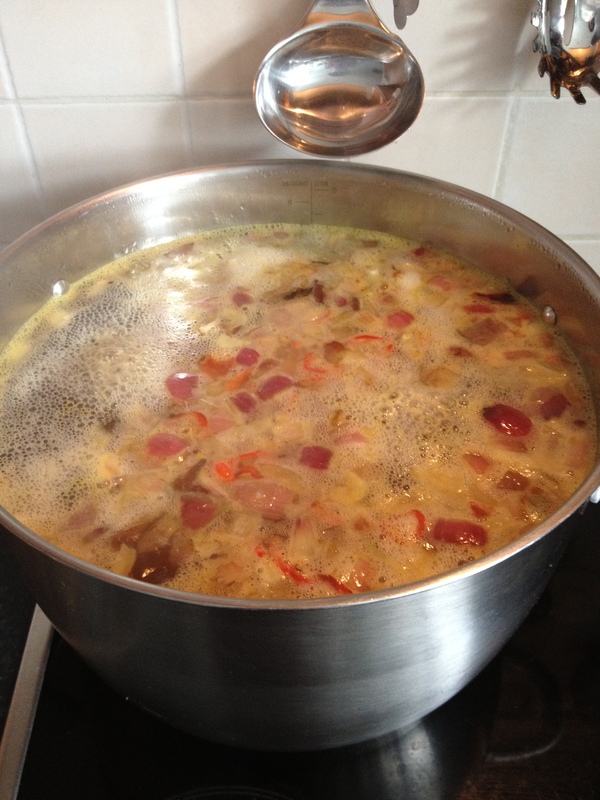 This stock pot makes a large quantity; I freeze extra for future busy days. 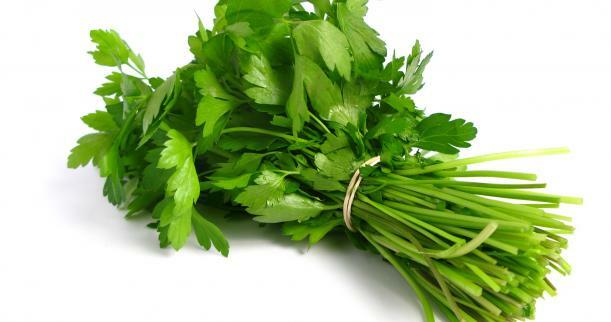 To increase the nutritional content of the broth serve with fresh chopped parsley or coriander. PS. When I am preparing bone broth or meat stock pots I am taking a compromise between long slow cooking and time management so that as someone running a home and a business single handed; I can still obtain good nutrition in my day. If you have time, I suggest, when cooking bones or meats such as lamb or beef on the bone that you let the meats or bones simmer for as long as possible on a low heat such that the meat is falling off the bone tender and more nutrition is extracted from the bones and tougher soft tissue parts into the stock. Be sure to add some wine or vinegar to bring out the flavours and nutrients. Some people prefer to strain their broth to obtain a clear liquid. This can then be stored in the freezer or fridge. For this you would not add so many vegetable to the mix; only the essential flavour filled healing herbs and spices such as garlic, ginger, turmeric, chili, onions, and herbs. Broths and stocks can be used as a base for other meals, soups, and sauces; as a sauté liquid; and as a warming healing drink just as it is. Have fun with it! There are many many recipes for broths and stocks on the internet; refine your search with key words such as: Paleo, nourishing and primal; the word frugal also brings up some helpful sites. I would like here to add two further broth recipes taken from highly respected sources; the first from The Westen A Price Foundation (http://www.westonaprice.org/food-features/broth-is-beautiful) and the second from The Nourishing Gourmet (http://www.thenourishinggourmet.com/2010/10/homemade-chicken-broth.html). 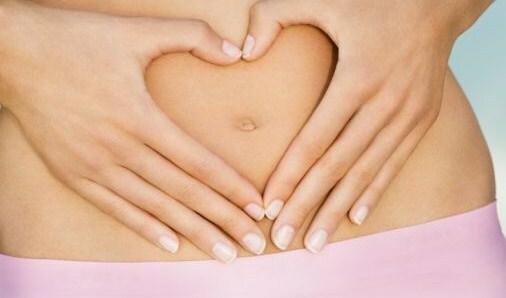 It is worth exploring their recipe options as they are super healthy. 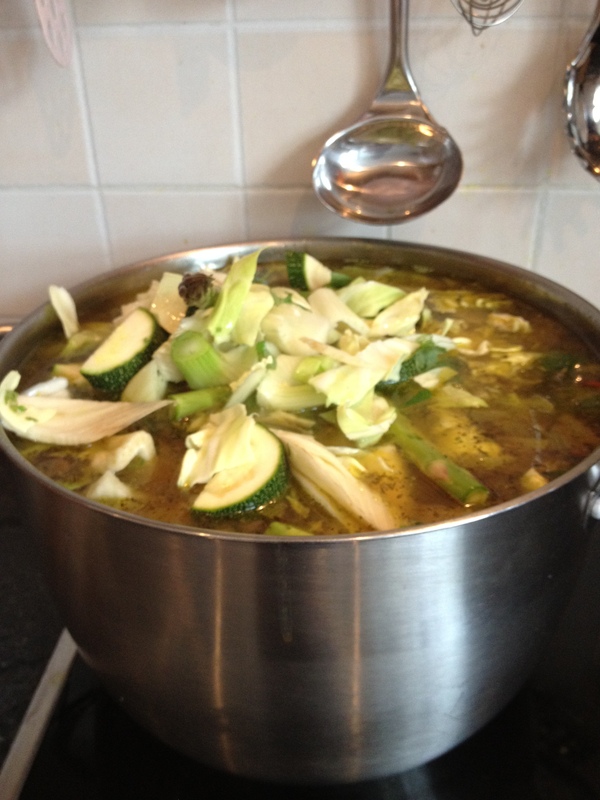 Here also is an exceptional article from Marks Daily Apple http://www.marksdailyapple.com/the-perfect-pot-of-primal-soup/#axzz2c44o0HA2; well worth a read and again the recipes look tasty :-). 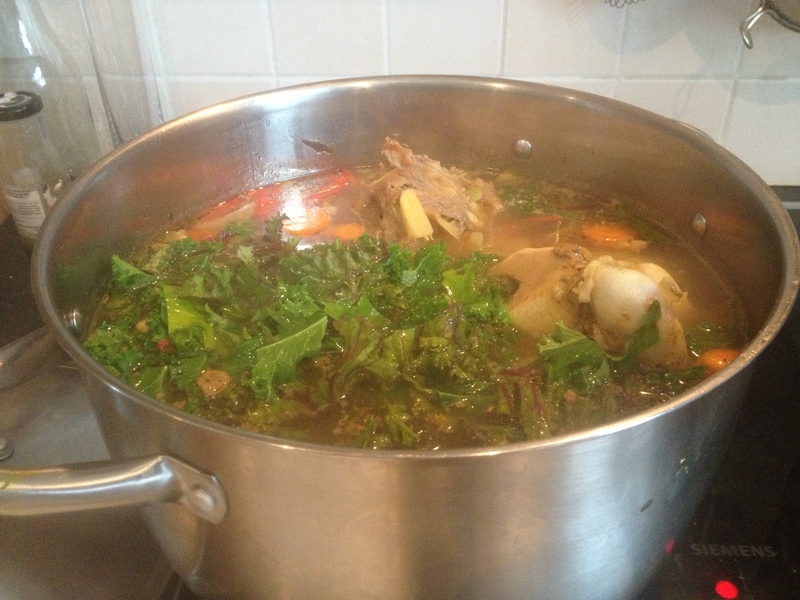 This entry was posted in Recipes - Healing and nourishing foods and tagged andrea cullen, Bone Broth, bone marrow bones, detox broth, gastrointestinal healing, stomach healing by Andreacullen. Bookmark the permalink. …Although gelatin is not a complete protein, containing only the amino acids arginine and glycine in large amounts, it acts as a protein sparer, helping the poor stretch a few morsels of meat into a complete meal. During the siege of Paris, when vegetables and meat were scarce, a doctor named Guerard put his patients on gelatin bouillon with some added fat and they survived in good health. If you can afford it, the free range birds will yield better tasting, richer, and healthier broth than the grocery store birds, but we make a decent broth with the turkey carcass from the grocery store turkey, too. Put the bones in a stock post and cover with water. If you break up a few bones that will add to the flavor of your broth. Add a couple tablespoons of vinegar, because vinegar will pull minerals out of the bones and into your broth, making it even more nutritious (we like apple cider or balsamic vinegar. A bit of wine may be substituted). Add two to four cups of vegetables such as onions, carrots, and celery. The vegetables should be chopped very coarsely- onions, for instance, can be quartered, celery chopped into four or five large pieces. Very frugal cooks will save the skins from onions and garlic cloves (they keep in the freezer) because these are nutritious and will add onion and garlic flavor to your broth without adding cost. The leaves to celery are also edible, and can be added to your broth for extra flavor. You may also add garlic cloves (even cloves that have started to sprout). Let this pot of bones, veggies, and water soak together for about half an hour or a little longer. Bring it to a boil and skim the surface as scum rises to the top. Discard this scum or feed it to your pets (you can put it over the top of a bowl of dry cat or dog food). Reduce the heat to simmer, cover the pot and simmer it for hours, even overnight (if you have a wood-burning stove, just set the pot on the back of the stove to simmer gently). Check periodically to make sure there is still plenty of liquid. Sally Fallon says to simmer from 6 to 24 hours. Just a few minutes before removing it from the heat, add some fresh herbs for added nutrition and flavor- fresh herbs such as parsley, rosemary, basil, sage, and bay leaves. Pull the bones out with a pair of tongs. If there is any meat left on them, let the bones cool and then pick the meat off with your fingers or a fork. Otherwise, discard the bones. Strain the broth into a large container- I use double folded cheese cloth for this because I like a very clear broth, but a collander works just as well if you don’t mind a less clear version. Discard the vegetables (in a compost pile or feed them to pets or livestock), because you’ve just cooked the dickens out of them. Refrigerate your broth. The next day skim the fat off, which will have risen to the top and solidified. I save the fat and use it for the fat in gravies and sauces. The broth should be congealed, like gelatin- because this is real gelatin. It will liquify when reheated. Keep this in jars in your refrigerator or freezer. Reheat and use as needed when chicken stock or broth is called for in one of your recipes, or used it as the basis for any soup.